February has been a very rough month for Milli. Not only did it have only 29 days (meaning two less days of profit), but I also had A LOT of issues with my hosting provider and SSL certificate (more on that in a moment). However, I feel that some of the biggest advancements I’ve made until today were actually done throughout February. Milli has matured to a sustainable, profitable and popular website. Now, there are many things I can talk about regarding running a faucet, but since I know that the attention span of the average reader is limited, I’ll try to focus on the top five or six things that I feel made the most difference. I was left with only three other Captcha providers – Are You Human?, Recaptcha (by Google) and SolveMedia. I was afraid that changing the Captcha would affect the user experience of my site and would eventually bring down profits. Apparently, you can make money out of solving Captchas. So, if you have a lot of traffic that solves Captchas on your site, that can become an additional income stream. 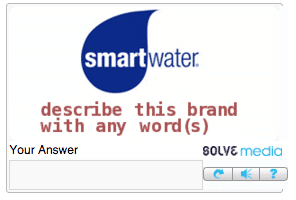 The way this works is that once in a while, instead of typing in a specific word, the Captcha will ask you to describe a brand with one or more words. This, in turn, translates to revenue. SolveMedia is as easy to set up as any other Captcha provider. The only thing you want to make sure of is that your Captcha mode is set to “revenue” and not to “security”. Don’t worry, you’ll still have basic Captcha security, but you’ll also be making money (you’ll see how much by the end of this post). Two technical changes I’ve made to Milli were to switch to a more reliable server and to add an SSL certificate. An SSL certificate is just a way to allow your website to appear on https:// instead of http://. It basically makes the website more secure, and most hosting providers will be happy to assist you with getting one. It does, however, have a cost. The main reason I added an SSL certificate, other than security, is to help Milli rank better on Google for specific terms (rumor has it that Google prefers https websites over http websites). Changing servers, however, was due to the fact that my original server was failing under the load. If you’re just starting out with your faucet, then it’s totally fine and even preferable to use a cheap shared hosting solution like Bluehost. But once the traffic starts to ramp up, you want a hosting provider that can cope with that traffic easily, and even more importantly, that has a SUPER dedicated support team. I ended up moving my hosting to a company called WiredTree. They offer VPS services (Virtual Private Server) that are much more robust than shared hosting. Also, they answer any support ticket you open within 30 minutes max. But service, of course, comes with a price, and I now pay $49/month instead of the $4/month I used to pay. All things considered, it’s worth it; as Milli grows bigger and bigger, I need to make sure it’s as stable as possible, since once you lose a customer, they rarely come back. 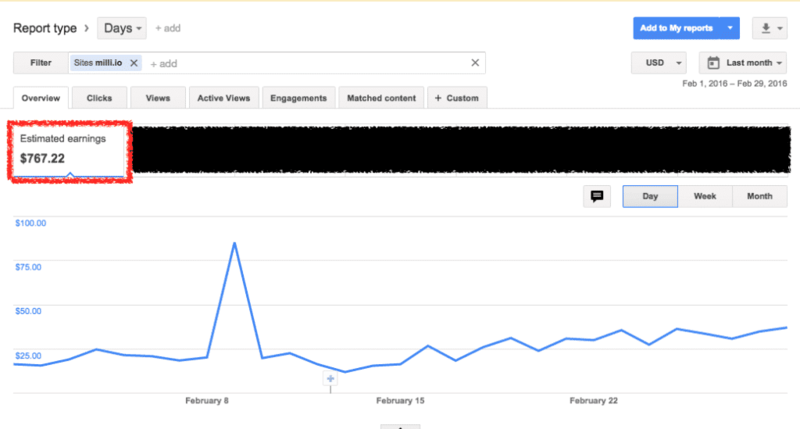 Throughout February, Google decided to close shop for many of the Bitcoin faucets out there. This means that the majority of faucets got banned from the most profitable ad network available. I initially noticed this when I saw that BitcoinZebra, one of the biggest faucets around, was up for sale. One of the things Google values the most is transparency. Most of the faucets out there today, including the big ones, maintain an air of anonymity around them. You don’t know who the actual owners are or even how to contact them in some cases. With Milli, I made sure to stay completely transparent about the fact that it is owned by 99Bitcoins. I also answer each and every comment on the site personally, without hiding my identity. Additionally, in my last post, I talked about enabling comments on Milli so that users will be able to speak their minds about the site. I feel that this has helped immensely in adding content to the site, and it also shows that the site is not just “in it for the money”. At the moment, I attribute the fact that I wasn’t banned from Adsense to these reasons, but as you know, this can change at any moment and without warning. At the end of my last post, I said I wanted to try out a new service called Adngin. What this service does is basically optimize your Adsense ads for maximum profit. Other than allowing you to use their software to create different A/B tests for your Adsense ads, you also get an account manager who will help you with the optimization process. The normal price of the service is $250/month, which is pretty high; however, since my traffic on Milli is still considered small in terms of online publishers, I was able to cut a deal for only $125/month with Adngin. I won’t go into the technicalities of how to set up an account, since you can just sign up for a free trial. However, here’s the difference in revenues between how my site was initially set up compared to the Adngin setup. So you can see that overall, throughout the month, Adngin’s setup helped me increase my revenues by over 23%. However, if you take a look at the last 14 days (not shown here), you’ll see that it has actually improved from that and is now performing 47% better than my original setup. So, if last month I made $618.28, it means that Adngin should bring this up by ~$140 through its optimization, meaning it’s worth the money. Did it deliver? You’ll soon find out. Now that I know the “money machine” is working, it’s time to pour in some more traffic in order to increase profits. At first, I tried to get different rotators to feature my faucet on their site, but I had no luck with that. Then, I figured I should just give out a higher payout. I decided to raise the maximum payout from 1,000 Satoshis to 10,000 Satoshis, and apparently it worked. Of course the chances of winning 10,000 Satoshis are pretty slim, but they still exist (people have already reported winning this amount on the comment section on Milli). Keep in mind when doing so to calculate the exact odds you can allow for such a payout so you won’t go bankrupt. So how much did I make on February 2016? Let’s start out by looking at my earnings. My Adsense earnings for Milli alone were $767.22 (an increase of 24% from last month, which was also two days longer). I’ve received four payments from Coinad in February totaling 0.53752749 BTC. I will later subtract that amount from my user payouts. 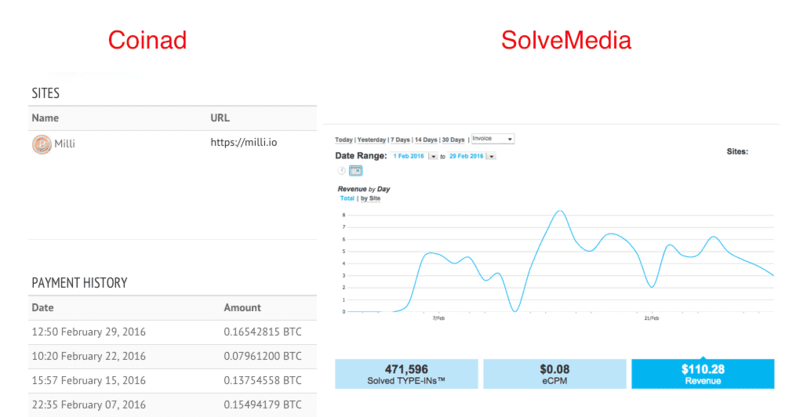 I’ve also made another $110.28 from SolveMedia through their Captcha service. So my total fiat earnings come up to $877.5. Payouts to users in February including FaucetBox fees – 1.08607691BTC (this is actually a bit bigger than the exact amount, but due to FaucetBox stat limitations, I will use this number). So, after subtracting my BTC earnings from the expenses, I’m left with 0.54854942BTC in expenses, equal to $235 in today’s exchange rate. Add that to my other fiat expenses and the total is $434. This brings me to a total profit of $443.29 in February, an increase of 6.81% from last month. I feel as if February was the start of the next big leap for Milli. Even though the increase in profit was only 6.8%, you need to keep in mind that February was a shorter month than usual, and I had A LOT of technical issues throughout the month that decreased my earnings even more. So I’m very optimistic moving towards March. I plan to move away from FaucetBox throughout March and into managing payouts on my own. Here’s why: First, their service costs a 2.5% fee. Second, when I rely on FaucetBox’s service, I also rely on their support, and that support is less than average. For example, as I’m writing this post, I have an issue with my faucet that hasn’t been dealt with for three days, since their support isn’t responding. I’m also planning on having some sort of “membership plan” on Milli, where people who have been using the faucet for a long time will get bonuses for their payouts. I will also change the referral structure to lifetime payments – meaning, if you bring a new user to Milli, you’ll get referral commissions for that user as long as he remains active. This, of course, will increase my referral payouts, but I’m hoping it will also increase the traffic to Milli. I have other, smaller ideas for Milli as well, but these two are the main ones. To sum things up, these are exciting times. Each day, I see Milli growing bigger and bigger and becoming a real, sustainable Bitcoin business. If you have any questions or comments on this post, feel free to write them in the comments section below, and I will see you next month in our next update. I’m not new to Bitcoin, but there are a few questions I can’t find the answers to. Where do the Bitcoins come from that are on faucets? I know you have to complete captchas, but where is the mining being done? How many coins, potentially, could any faucet release in one day? Do faucets suddenly “dry up” after so many uses? Thanks for any help. Surfing on the web I landed here… Very interesting infoes… Thanks and greetings from Italy! Great article! How much time daily do you spend administering and promoting the faucet site? Hello Offir sorry i am no talked about post, i mean about my CTR question. Because usually when the comment is aproved bellow are your replay, but in my last comment where i asked about CTR no. Hello after readed your guide i finally open my faucet after 8 days my CTR in google adsense are to low, CTR 0.05%, which CTR do you think is possible get in faucet market? What do you think i can do to increase my CTR? Hello Offir no uptdate in april?